While many still have Pats OC Josh McDaniels as the front runner for the next head coach of the Browns, today AP’s Tom Withers is reporting that Oklahoma coach Bob Stoops is a possible candidate for the position. Ian Rapport of NFL Network reported that Stoops would be on teams’ list as they look around for the next hot college coach. 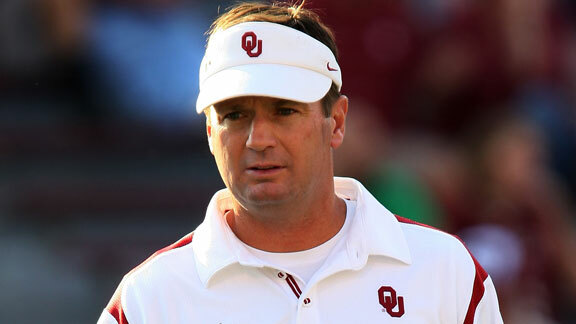 “Another name to watch, Oklahoma coach Bob Stoops. He also has expressed some interest in joining the NFL,” Rapoport told Rich Eisen on NFL Network during Monday’s coverage of the league’s head-coach firings. The Oklahoma coach went 10-2 this last season, and pulled off an upset of Alabama Thursday night in the Sugar Bowl. For now, McDaniels is set to talk to the Browns tomorrow about the coaching position, and many feel that it’s still his job to lose.